Tom Foley swarmed by reporters after accepting the GOP nomination. 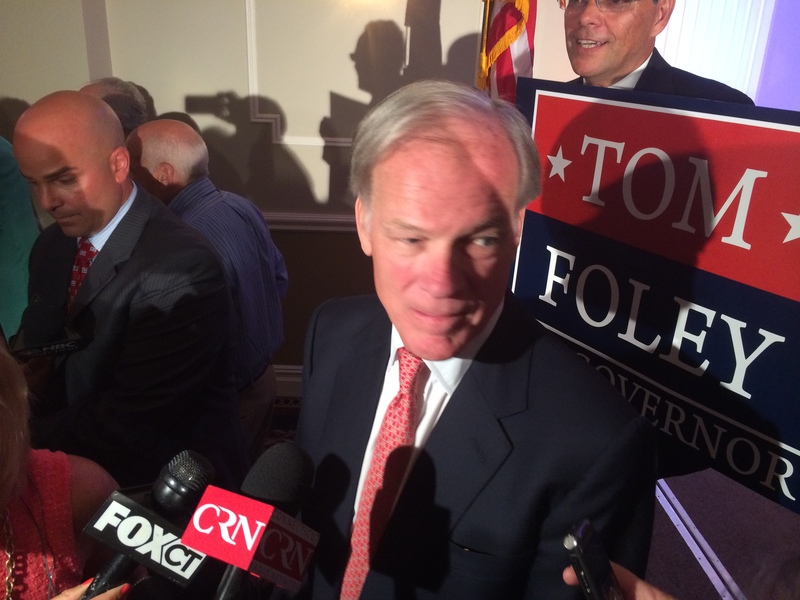 How’s this for bipartisanship: Republican Tom Foley and Democrats supporting Gov. Dannel P. Malloy agree that Quinnipiac University’s poll declaring the race a tie is accurate — and that last month’s survey giving Foley a six-point lead was faulty. Foley, who did not publicly disavow a six-point lead a month ago, is not being magnanimous. The GOP nominee is trying to disabuse the press and voting public of the impression that Malloy has momentum by turning his deficit last month into a dead heat in Wednesday’s poll. Seeming to anticipate another bad result, the Democratic Governors Association complained Tuesday that Quinnipiac was under-sampling Democrats in its polls this year, and Foley said Wednesday that he believes the DGA is onto something. Some Democrats close to Malloy, whose campaign generally does not comment for the record on polls, suggested the same thing a month ago, when Quinnipiac found Foley leading Malloy, 46 percent to 40 percent, after its previous surveys showed ties. Foley said he believes that Quinnipiac made a mistake and inverted the numbers for Democrats and unaffiliated voters on the poll’s “turnout model,” an assumption of how many Democrats, Republicans and unaffiliated will turn out to vote next month. But there is a problem with that theory. Quinnipiac says it doesn’t have a turnout model, at least not one that weights results to reflect actual party affiliation, a technique used by some pollsters. Douglas Schwartz, the poll’s director, said Quinnipiac does not adjust or weight its numbers according to a model of who is expected to turn out by race, age, gender and political affiliation. Instead, the poll uses a set of screening questions to gauge who is a likely voter. “There are no assumptions about turnout,” Schwartz said. Schwartz said Quinnipiac does weight its raw sample to ensure that it reflects census data for race and gender, but the demographic information attached to each poll reflects the breakdown of respondents judged to be likely voters after answering the screening questions. As a result, he said, the demographic composition of the polling sample can change from one Quinnipiac poll to another, as it did from the survey in September to the one released Wednesday. In September, the sample was 26 percent Republican, 31 percent Democrat and 38 percent independent. This month, the GOP number was the same, but the Democratic sample grew to 34 percent and the independent number dropped to 35 percent. Actual registration in Connecticut is 38 percent Democratic, 20 percent Republican and 42 percent unaffiliated. Schwartz said the variations are within the margin of error for each political subgroup, about 5 percent. So, there is no turnout model and no transposed numbers. “There is not much of a difference between the two samples. It is very slightly more Democratic,” he said. The racial breakdown also changed, dropping from 86 percent white in September to 83 percent white this month. Schwartz said turnout modeling is only as good as the assumptions. In 2012, many GOP pollsters insisted that Mitt Romney was winning, assuming that the high turnout of enthusiastic black and young voters in 2008 during Barack Obama’s first race was an aberration. But instead of regressing to the so-called norms of the previous presidential year of 2004, it stayed closer to the voting demographics of 2008, giving Obama an easy victory. Black turnout rates actually exceeded that of whites in 2012. In Connecticut in 2012, the pollster for the U.S. Senate campaign of Linda McMahon challenged a Quinnipiac poll showing Democrat Chris Murphy with a 49 percent to 43 percent lead a week before the election, claiming that Democrats and blacks were overrepresented in the sample. It turned out the poll did not predict the result: Instead of winning by six points, Murphy won by 12. So, the bottom line on Wednesday’s poll is that Republicans and Democrats agree it reflects the state of the race for governor of Connecticut: It is competitive, as it’s been all year. That likely will require another poll – or the election. Or, say Democrats, Foley could share his internal polling from September to prove that he never had a lead by his own data.